eBay helping Cat Chat - yay! Re: eBay helping Cat Chat - yay! Oh knickers I missed it. I am always on ebay .... sod's law this came up while I was on holiday and not spending! Thanks to all of you who gave a £1 to Cat Chat on the eBay scheme! We don't know the amount raised yet but it was very successful I understand. eBay only featured animal charities for that one week, but with a bit of luck they may do it again sometime. We heard that they normally rotate 3 charities at the same time so that there's a 1-in-3 chance of each charity coming up, if anyone knows if that's right we'd be interested to know. It's just great to know they don't only help the big charities! Yes Im sure. If I pay for something earlier on in the day, then the charity will change if I go back and pay for something else. If I dont donate to that particular cause from the earlier payment, it will be the same one when I go back. Oh course it could change from day to day to give others a chance. Stuart...the same charity stays on till you donate to it, once you donate then it changes. Awww, is it only till the 10th of May ?? will they be doing CC again ??? 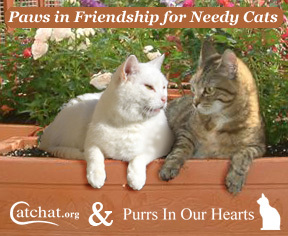 How about this - we've just heard from eBay that they are including Cat Chat in their Give a Pound promotion! Between 4th and 10th May 2009, Cat Chat is one of the featured animal Charities in eBay's 'Give a Pound' scheme. So, if you are buying on eBay that week, please look out for Cat Chat at the checkout - and give £1 if you can - thank you! Great to know they are helping us smaller charities and not just the big boys! !